To become and remain successful is becoming increasingly challenging for all businesses today. Business face uncertainty and relentless change, they need to be agile, nimble and ever changing. It is no longer enough for them to only look at the opportunities offered by the market and at the customers. While this may lead to some success, it is not enough. They also need to build organizations inner capabilities to cope with the needs of the contemporary times. A capable business organization is the best strategy today. Traditionally Information Technology (IT) has been seen as a source of efficiency for the existing processes. The potential of IT to create business capabilities has been grossly under exploited.The book highlights how IT can be exploited for building organizational capabilities and sustained strategic advantage. This book helps all CEOs, Business Heads along with IT Heads to answer this question. Looking Inward is a big departure from the business thinking of the stable era, it requires CEOs to focus on generating business capabilities to become agile and nimble. 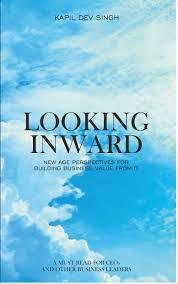 The book brings fresh and unique perspectives around exploiting IT for creating business capabilities. It describes the new business paradigm, discusses the strategy, structure, leadership and new technology issues and presents an empirically validated framework for building business value from IT. The book is available at Meri Pustak.